Maybe you, reading these words, were the only Jew in your elementary school class, and maybe around Chanukah time, your mother would come in with a large shopping bag full of the wax-covered menorah from home, candles, plastic dreidels, and five pounds of potatoes. You would sit close to her, but not too close, as she explained what Chanukah was and why Jews celebrated it. And then you helped pass out dreidels and grate potatoes as your mom heated the oil in the electric frying pan. Or perhaps you grew up the child of immigrants who did not speak English at home, and when friends came over, you had to explain why your parents spoke a different language. Maybe you traveled through Europe or India and found yourself the only American in a crowded youth hostel lounge, fielding questions about what Americans do and think. You will likely understand that individuals, groups, and whole societies are pressed to explain themselves when they encounter people whom they are unlike. The way they explain themselves, however, is rarely static; it depends on to whom they are speaking, where and when the conversation is taking place, and whether the listener appears interested. Over the course of Jewish history, Jews often thought of themselves as living among strangers. Through stories, rituals, laws, and folkways, Jews sought to understand their relationship to non-Jews. In the modern era, in a more sustained fashion than any other historical period, explaining—or presenting—Jewishness to non-Jews became a political necessity and an act of Jewish survival. For some Jews, the task bred ideological fervor, a sense that Jewishness was enacted only when Jews were busy addressing themselves to the non-Jewish world. Even for those who were not so fervid, few Jews could navigate modernity without considering how to talk about being Jewish to non-Jews. This book is about some of the ways in which American Jews explained themselves to non-Jews and how the meaning of Jewishness became inseparable from their explanations. In the United States, Jewish leaders—rabbis and intellectuals—sought to generate a public language of Jewishness, one that carried authority and was disseminated into an American public sphere. Speaking of Jews is a history of how these leaders talked about Jewishness in public from immediately after World War I through the civil rights era. As the most widely recognized spokespeople of American Jews, countless rabbis devoted themselves to creating an American language of Jewishness. Taking to the roads, the airwaves, the printing presses, university classrooms, and pulpits across the country, rabbis engaged in the central and as yet unexamined project of presenting Jewishness to the United States. Their task, as they saw it, was as much about defining a collective identity as it was about crafting an ideology about the relationship between Jews and non-Jews and the role that Jews could play in a non-Jewish society. At different times and in different contexts, rabbis claimed that Jews' religious ideals, their history, or their distinctive behaviors allowed the United States to forge ahead with its democratic experiment. When properly conceived, a public language of Jewishness, instead of marking Jews as outside of or peripheral to American life, enabled Jewish leaders to define Jews as indispensable to the United States. Just as rabbis were developing new American ideologies of Jewishness, an intellectual revolution—what I call a social-scientific turn—irrevocably imprinted itself on the way Jews talked about their Jewishness. The stirrings of a new discourse of Jewishness emerged in the 1920s, when the social sciences offered a vital, nonreligious, nonbiological, and increasingly popular language in which Jews could explain themselves to Americans. Although the other social sciences, including psychology, anthropology, economics, and political science, were part of the social-scientific turn, sociological language and models became unrivaled sources of authority, sculpting the public language that American Jewish leaders used to talk about Jewishness.Over time, rabbis filtered their own pronouncements about Jewishness through sociological language and even through prominent sociologists themselves. By the World War II era, sociological Jewishness had become the central framework through which Jews translated themselves to the United States. In its universalization of communal distinctiveness, its commonsense functionalism, and its sheer popularity, sociological language endowed Jewishness with the kind of meaning and purpose for which American rabbis—and many other Jews—had searched. Refracted through a sociological framework, Jewishness was explained as a set of collective patterns and behaviors, many of which corresponded to the circumstances of one's birth into a Jewish family. Religion, according to this model, was a functional Jewish identity marker, no different from education level, occupation, neighborhood, or friends, all of which similarly could explain where a person fit in the structure of American society. The Jewish social-scientific turn had deep American roots. Starting in the late nineteenth century, American universities had established sociology departments, which were thriving by the early decades of the next century. In the World War II era, the federal government recognized sociology as nationally valuable and channeled money to support sociological studies and institutes in hopes that they would illuminate the path toward social harmony and national strength.Simultaneously, Americans increasingly relied on experts who used empirical and rational methods to make sense of daily life.The Jewish attraction to the social sciences paralleled these trends, yet it was also a response to the particular circumstances of minority and Jewish life. Already in nineteenth-century Europe, Jews had distinguished themselves as crucial contributors to the nascent field of sociology, using its methods to makes sense of the political, economic, and religious upheavals afoot.Whether in Europe or the United States, sociology offered minority groups an opportunity to integrate their experiences into larger national contexts. It also became a crucial political and ideological tool that members of minority groups used to influence the direction of social change. As a group, Jews were the subjects of a number of important sociological studies, and some of the most important American sociologists by the mid-twentieth century were Jews themselves. None of this was inconsequential. The fact that Jews helped mold the field of sociology is critical to understanding why sociological language became so useful in Jews' efforts to explain themselves to the United States, although this is far from the only reason sociology appealed to American Jews. For Jews, the ineffability of Jewishness had long pressed the questions of where they belonged and which categories of personhood—bodily, communal, or religious ones—best described them. Indisputably, Mordecai Kaplan's revolutionary reformulation of Jewishness penned in the 1920s and 1930s was an essential foundation for the social-scientific turn and predisposed rabbis—many of whom considered themselves Kaplan's students—to feel comfortable in the idioms of sociology. Jews, Kaplan wrote in Judaism as a Civilization, should be understood as a "distinct societal entity. "Drawing in no small part on early sociologists, especially èmile Durkheim, Kaplan explained that what made a Jew a Jew was not what he or she believed, but how he or she lived. Religion, in other words, was a social phenomenon, and Jewishness, larger than religion alone, was a composite of social phenomena. What sociology seemed to offer was a functional way to define Jewishness that corresponded to the lived lives of Jews. Understood through midcentury sociology, Jewishness was a social fact that limned the kinds of interactions Jews could have with non-Jews. The original source of difference between Jews and non-Jews did not interest sociologists as much as the daily realities of that difference. Religion understood as a social phenomenon certainly marked people as different from one another, but it did so in remarkably consistent, even universal, ways. While rendered as description, sociological explanations of Jewishness came to exercise prescriptive force. Sociological explanations of Jewishness designated only certain patterns as normal, tying those to core American values. Behaviors inconsistent with this new language of Jewishness could simply be dismissed as deviant. In the post–World War II era, as rabbis and Jewish leaders explained Jewishness more and more in sociological terms, counterexplanations were overshadowed. The language of sociological Jewishness became ubiquitous and could be found in popular articles and books about Jews, in sermons and lectures delivered in front of large audiences, and on radio and television broadcasts. It seeped into the everyday ways Jews and non-Jews talked about Jewishness, and it influenced how Jews thought about themselves and their future. While Jews had been grappling with how to shape a particularly American Jewish identity since their earliest settlements on American soil, the period from the end of World War I through the civil rights era saw the flourishing of Jewish attempts to create a public and synthetic American Jewish identity. By the 1920s a significantly expanded American Jewish population had started to stabilize because of new restrictions on immigration to the United States, and as European Jewish life crumbled, it became the central body of diasporic Jewry. In many ways, this process culminated by the end of the 1960s, when all measures indicated that Jews in the United States had achieved economic, political, and cultural success, and when the next generation—the baby boomers—started to rebel against the terms of their parents' success. Over these same years, a thriving world of Jewish popular culture developed: radio broadcasts, novels and short stories, films, theater and dance productions, music, and the visual arts were instrumental in shaping Jews' encounters with non-Jews.Jewish authorities and intellectuals, the focus of this book, generated self-conscious explanations of Jewishness, aware—sometimes painfully so—of the cultural landscape in which they lived. In imagining and disseminating new modes for talking about being Jewish, they hoped to control how Americans understood Jews. At the same time, they worked to reshape the available language in which Jews themselves thought and talked about Jewishness. Most important, these leaders perceived their efforts to create public, popular, and American explanations of Jewishness as essential to the long-standing project of Jewish survival itself. Being treated in law as individuals compelled American Jews to question the terms of their collective existence: whether it served an ongoing purpose, and on what foundation it could rest. Already Jews in Enlightenment-era Europe had started wrestling with these questions, as they were (or in some cases, imagined themselves to be) on the brink of emancipation into full citizenship. Jewish Enlightenment thinkers sought to define Jews as guides for the process of modernization and, in effect, positioned Jews as avant-garde. Initiating an explosion of new cultural and political movements, many of these thinkers conceived of Jewishness as an ideology to mediate between Jews and the non-Jewish world. Yet for the most part, European nations and thinkers defined modernity in opposition to Jewish religion and culture, designating Jews as a problem or obstacle along the path toward social improvement. America, a polyglot, heterogeneous society even well before nationhood, took a very different route to modernity.An open immigration policy, a thriving slave economy, a denominational—not centralized—ecclesiastical structure all made difference an indelible part of American life. Figuring out how to balance aspirations for national unity with the reality of diversity was an American obsession. The solutions that policy makers and thinkers proposed—creating hierarchies of belonging and not belonging, establishing assimilationist and Americanization programs, waging campaigns to teach Americans how to appreciate difference and how to be different—shaped the political, economic, and cultural life of the nation.Jews were neither the originators nor the primary subjects of these debates about diversity. Rather, they entered into an ongoing conversation. But, as in many European countries, Jews also had a particular stake in guiding discussions about the role of difference in modernity. Jewish leaders in the United States realized that Jewish survival could not be taken for granted, though not for the same reasons that challenged it in Europe. American citizenship law, in theory, promised to protect Jews as individuals, but it extended no similar protections over Jews as a group. The social prejudices and discriminatory policies that American Jews experienced never issued a persistent threat to Jewish survival. America's commitment to liberal individualism, however, accosted the collective dimensions of Jewish life. American Jews became deeply invested in producing and revising American ideologies about social diversity, like pluralism, liberalism, and individualism, for the simple reason that these ideologies held promise to sustain or disrupt Jewish life. 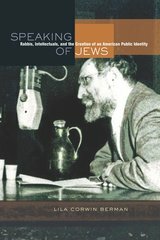 Scholars and commentators on American Jewish life have explained why Jews have maintained such a strong tradition of liberalism and, alternatively, why some shifted away from that liberalism.Yet in drawing attention to the ways Jewish leaders crafted a public language of Jewishness, I necessarily raise a different question about Jewish liberalism: how did Jewish leaders rearticulate American liberalism and embed it in their efforts to conserve group identity? In the same years when many Jewish thinkers were suggesting the ways that group distinctiveness could play a vital role in American democracy, most Jews were learning to look and act like Americans—through their worship styles, their consumer habits, their political loyalties, and their leisure patterns. This has been richly documented by a number of historians.Absent from most studies of Jewish life in the United States, however, is a consideration of the language that Jews crafted to explain themselves into American life. While this book does not ignore popular culture sources—like films, television programs, and novels—as channels through which non-Jews encountered Jewishness, its aim is to explain the intellectual framework Jewish leaders created to make Jewishness intelligible to the American public. By showing how Jewish leaders attempted to formulate Jewishness as an ideology to mediate between Jews' desire for acceptance into the United States and their commitment to Jewish survival, I hope to contribute to a larger historical and political discussion about how people, communities, and nations have encountered the tension between humanism or universalism on the one hand, and particularism or distinctiveness on the other.Americans Jews were forced to be self-conscious of their differences from other Americans, but they were also given the freedom to eradicate many of those things that made them different. Jewish leaders used their stature and authority to propose a public language of Jewishness, broadly accessible and even attractive to non-Jews, that could nonetheless articulate an ongoing purpose for Jewish distinctiveness. By no stretch did Jewish leaders arrive at perfectly balanced formulations of Jewishness. Depending on one's perspective, they may have even failed miserably. Yet what interests me is how they again and again revised the terms of Jewishness, responding to demographic, political, and cultural transformations in American and Jewish life. The rabbis and intellectuals portrayed here were, of course, not speaking for every Jew. Nonetheless, the figures I chronicle in this book imagined that their understandings of Jewishness corresponded to realities of Jewish and American life. They also believed that, through their public authority and the positions they occupied, they could reshape those realities. Often their conversations were insular—taking place at academic conferences or meetings with other rabbis—but these rabbis and intellectuals were also committed to speaking in places where Jews and non-Jews would hear them: synagogues, college campuses, summer camps, brotherhood meetings, fund-raisers, historical commemorations, rallies, Jewish newspapers, American popular magazines, highly publicized books, radio shows, and television programs. The fact remains that they were an elite group. While women certainly joined these public conversations about Jewishness, the majority of the historical actors in this book are men, a function of the gendered nature of the rabbinate and academy during the time in which they lived. Their efforts to explain Jewishness were enmeshed with gender ideals and anxieties. These leaders were also among a set of educated Jews who lived at a time when many Jews were not formally educated. Furthermore, until World War II, among the rabbis involved in rethinking the language of Jewishness, Reform rabbis figured disproportionately, for many reasons. First, with two-thirds of Reform rabbis ministering to small Jewish communities outside the northeastern corridor, they were pressed more than other rabbis to explain Jewishness to curious, incurious, and sometimes hostile onlookers.Second, the Reform movement had the deepest institutional roots in the United States, established before the massive wave of eastern European immigrants invigorated the American Orthodox and Conservative movements. As a result, Reform Judaism developed an infrastructure for interacting with the non-Jewish world far earlier than the other movements. Finally, ideologically and intellectually, Reform Jews tended to be more concerned with life outside a purely Jewish context.By the World War II era, many Conservative rabbis took their place alongside Reform rabbis and devoted themselves to explaining the relationship between Jews and non-Jews. As hundreds of Conservative synagogues sprouted in the burgeoning suburbs, Conservative rabbis became the face of Jewishness to postwar America. Rabbis were joined by Jewish intellectuals, especially, as I argue, social researchers in the pursuit of creating Jewishness as an exportable, comprehensible, and indispensable American idea. With attention to who was speaking, who may have been listening, and in what context, I trace how rabbis and intellectuals crafted a public language of Jewishness to communicate the relationship between Jews and the non-Jewish world in which they lived. In the first chapter, I explore two avenues through which Reform rabbis formulated Jewishness for the United States in the 1920s: their lecture tours to college campuses, and their efforts to create a Jewish missionary movement. Whether talking to predominantly non-Jewish college students or imagining the terms of missionary Judaism, these rabbis tended to define Jewishness as a set of ethical precepts that could guide anyone in better apprehending and inhabiting the world. Jewishness, they asserted, could help an individual in need just as ably as it could revitalize a nation suffering from the malaise of a brutal and seemingly meaningless war. These same years, however, saw the emergence of a new vocabulary of Jewishness formulated in sociology departments and Jewish research institutions. In chapter 2, I argue that, instead of defining Jewishness as an ethical force, sociologists observed it as a social force. The utility of sociological Jewishness as a public discourse through which Jews could explain themselves to non-Jews became abundantly clear in the decades following the 1920s. Chapter 3 illustrates the efficacy of sociological language for explaining Jewish distinctiveness and Jewish Americanness by exploring how rabbis and sociologists talked about Jewish marital patterns in the interwar years. As sociologists increasingly equated social harmony with family harmony, many rabbis learned to position Jewish endogamy (or inmarriage) as an American value. Sociological vocabulary filtered into rabbis' normative pronouncements against intermarriage, while at the same time religious norms sculpted sociological models, eroding boundaries between a so-called sacred realm and a secular realm of human inquiry. By World War II, Jewish leaders were convinced that Jewish survival in the United States depended on sociological explanations of Jewishness. A cadre of Conservative rabbis, the subjects of chapter 4, maintained that the ultimate purpose of Jewishness was its function outside the Jewish world. Even while some rabbis highlighted Jewish spiritual insights, they still explained Jewishness through its instrumental and social terms: Jews, as a group, served the public good by mirroring and confirming nationalistic goals. In the cold war era, a number of Jewish intellectuals were motivated to align Jewishness and national goals even more precisely. Chapter 5 describes how they helped reformulate sociological thought to reflect what some termed an essential American ethnic pattern, simultaneously recrafting the meaning of Jewishness and Americanness. While rabbis and Jewish intellectuals put their faith in the ability of a sociological vocabulary to guard Jewish survival, some started to sense the limitations of this model of Jewishness. Chapter 6 argues that the postwar resurgence of missionary thought among some Reform rabbis and the growth of a more general outreach movement to non-Jews pushed the boundaries of Jewishness and threatened to disrupt its assumed sociological fixity. The final chapter describes a new kind of stumbling block to Jewish leaders' efforts to explain Jewishness: rising rates of intermarriage. Indicative, perhaps, of their success in explaining Jewishness as being both attractive and fundamentally American, marriages between Jews and non-Jews seemed to call into question the very project of making Jewishness knowable and familiar to the non-Jewish world. A community that had come to articulate itself as a product of social facts became embroiled in a survival crisis when those social facts proved impossible and undesirable to sustain. Living in a time when integrationist ideals pervaded American culture and politics, and bombarded by studies about ever-increasing intermarriage rates, rabbis and Jewish leaders found themselves without a vocabulary of Jewishness that could make sense of their times. This book ends with leaders searching for a new language of Jewishness and experimenting with what I term a language of volition: a language that describes Jewishness as a choice, not a social fact, not a religious mandate, and not a biological rule. Yet blood, God, and community are tough to replace or discount, as anyone thinking about Jewishness in the beginning of the twenty-first century would likely admit. Much of this book is about changes in Jewish self-understanding. Still, Jewish leaders and intellectuals consistently drew analogies between Jewishness and the United States. The Jewish story, they proclaimed, was a metonym for the American story. Such was their faith in America's inclusiveness, and their willed attempt to subvert narrower or less tolerant narratives of America's heritage. But the same statement could produce a new mechanism of exclusion, suggesting that other Americans, particularly other new Americans, who did not follow the same social, economic, and political patterns as the Jews, were perhaps less worthy exemplars of the American story. Clearly, Jews suffered social exclusion in the United States, but this fact did not negate the parallel existence of Jewish pride and even feelings of superiority.The conviction—of faith and of necessity—that Jews and Judaism had a uniquely meaningful message to give the modern world sustained Jewish life in modernity and fueled Jews' efforts to explain themselves to, and as, America. Lila Corwin Berman is Associate Professor of History, the Murray Friedman Chair of American Jewish History, and the Director of the Feinstein Center for American Jewish History at Temple University.